What do you do on a rainy day? 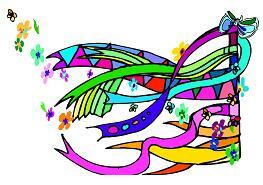 How about downloading our kite coloring pages and make a dull day turn into a colorful collage. 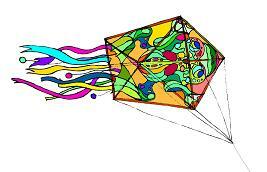 That will cheer us all up, especially when we can let our imaginations take us to a sunny, breezy day, where a spectacular of colored kites fill the sky. To download any coloring page all you have to do is signup to our free CraftsWork Newsletter and Printables and we will have access to all the free printables on this site. Look at the picture on the right. It`s a leaping frog! Think of the colors that will make it look bold and bright in the sky. Green, yellow, red, and there`s some blue in it too. Download the image and get an adult to copy and print the outline for you to color it with your choice of colors, or any of the others. You may even know how to do it yourself. Once upon a time, there was a town where everyone was feeling sad. No matter what idea they thought up to make people smile, it didn`t last for long. Something had to be done, so the Mayer of the town decided to have a kite flying competition. Soon everybody was buying kites and learning to fly them for the big day. It was so exciting. Caroline ran to her green piggy bank and shook it hard. The noise of the coins jangling inside caused a big smile to appear on her face. 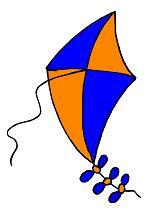 "I think I have enough pennies to buy a little kite", she said, and hurried off to the kite shop. Now you must finish the story while color your pictures. Have you ever been to a kite festival? 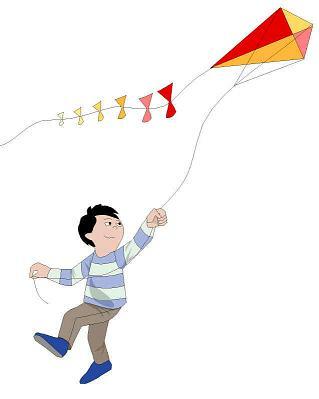 You will see lots of different animal, bird, and fish kites in the blue sky. They almost look like they are swimming in the sea. I have 2 kite coloring pages for you to choose from. 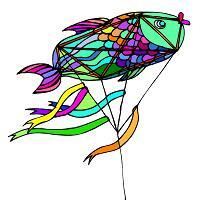 One fish is really a diamond kite with fins drawn on the sail and some short ribbons for a tail. It looks a lot like a fish doesn`t it? 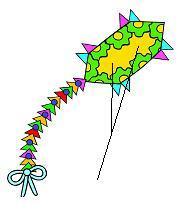 You could try to make a kite like this. The other page is a fish made from a different shaped kite with fins and a tail attached to the sail. The ribbons on the kite string look like sea weed don`t they? Some of these kite coloring pages can be a little tricky, so this diamond kite will make it a bit simpler. There are not so many bits to fill in. You can even stick pretty paper, or feathers, or fabric. Anything you like to fill the big diamond shape. That would make an interesting collage for a paper crafts project. 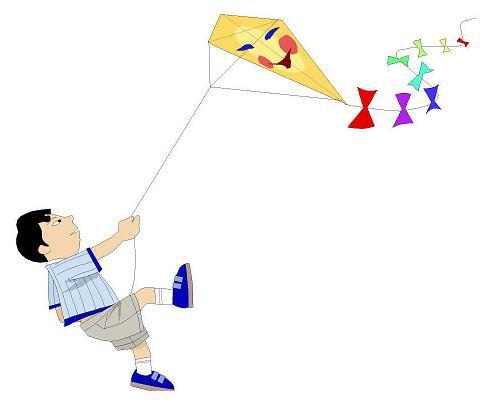 Did you know that the first diamond kite was called an Eddie? These kites are easy to make and fun to fly. Do you like people in your pictures? These two kites have two boys pulling on the end of their kites. One is trying hard to hold on to his kite. It must be a very windy day! But the other boy is having no trouble at all. That reminds me of Iain and James when they go kite flying. It used to be a bit tricky for James but he is older now and much more competent. When you fly a kite, make sure the wind is not too strong or you will loose it, and always make sure the wind is behind you. Check too that there are no electricity pylons close by. It`s dangerous if a kite gets caught in one. 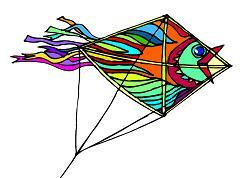 The last of our kite coloring pages is not really a kite, but you will see lots of these at kite festivals. It`s a kite pole! People like to attach lots of wind toys, ornaments, socks, ribbons, and flags to them. Some people like to have them in their gardens too, so there are some flowers for you to color. Have fun coloring in your pictures! But come back soon to get some more kite craft ideas.